Scenario: Installing a PC in a hazardous area can be quite a challenge. The CPU and monitor can be mounted inside a pressurized enclosure, but the keyboard and mouse need to be accessible to the operator. Fortunately, there are a number of intrinsically safe keyboards and pointing devices available, but these must be used in conjunction with an intrinsic safety barrier. Problem: Traditional Zener type safety barriers introduce voltage drop in the connections, and require a high-integrity ground connection to meet code. This can be problematical for mobile equipment, not to mention ground loop issues when data and signal connections are brought together from different systems with different power sources. Solution: The EX210 PS2 Isolating Barrier overcomes these issues by providing galvanically isolated ground-free power and data connections. It hooks up using familiar industry standard DIN plugs and cords, and derives it’s 5V power directly from the PC. 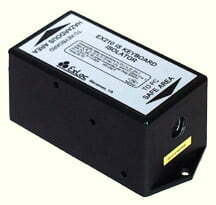 The isolator is designed for direct surface mounting inside the pressurized PC enclosure using two screws. The iSOLATE100 intrinsically safe interface enables suitably certified hazardous area peripherals, such as a mouse, keyboard, or barcode laser scanner to be connected to a PC in a safe area. 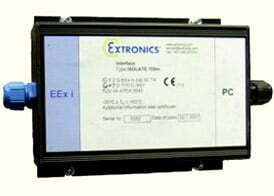 It uses a combination of galvanic and optical isolation to transfer power and data. Alternative versions permit PS/2, RS232, and RS485 operation. The keyboard or pointing device may be located up to 65 feet (20 meters) from the PC using PS/2 cable, or up to 230 feet (70 meters) using CAT6 STP cable. The iSOLATE100M can be installed in a Zone 1 or 2 hazardous location. It enables suitably certified hazardous area peripherals such as a keyboard, mouse or barcode laser scanner to be connected to a PC in a safe area. It uses a combination of galvanic and optical isolation to transfer power and data and provides a more practical solution than conventional safety barriers. 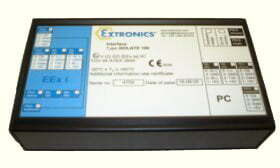 Alternative versions permit PS/2, RS232, and RS485 operation. The keyboard or pointing device may be located up to 65 feet (20 meters) from the PC using PS/2 cable, or up to 230 feet (70 meters) using CAT6 STP cable.